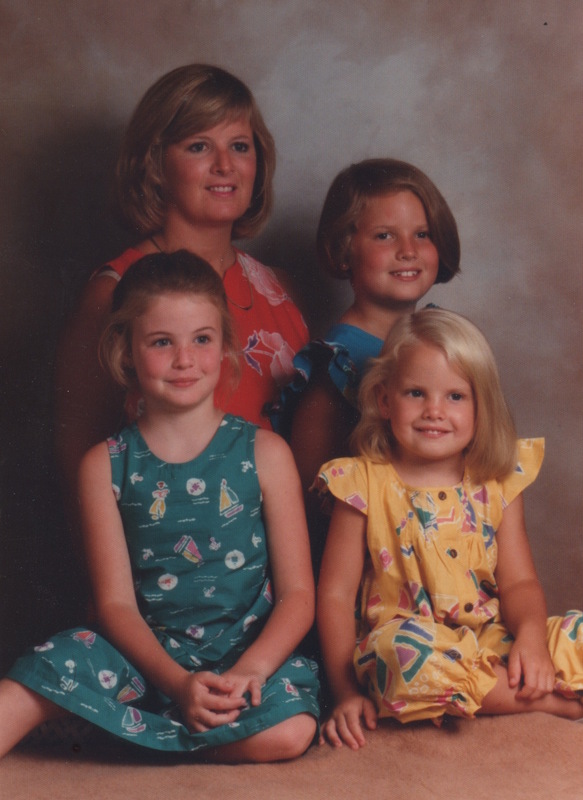 I grew up the middle of three girls. We seem normal, for the eighties, that is, in the picture below. But what I am about to share with you may cause you to question just how normal my sisters and I really were. Like many children, we were imaginative and creative players, something a parent has every right to be proud of, something I hope to instill in my boys. We played “Rescue 911” in which we would rescue our pound puppies who had been strategically placed in perilous situations by repelling down small hills with jump ropes tied around our waists. We also created our own “ice skating” routines in our roller-blades with many complex features such as the Triple-Bunny-Hop and the Ghost-Buster. Our shows (think Roller Derby meets Sesame Street on Ice) were performed in our very own driveway for our three adoring fans. But what takes the cake, what propels us quickly out of the arena of imaginative play and into Weirdsville, is the game I am about to share with you. You probably don’t remember or know the story of Jessica McClure, but she was a little child who somehow got stuck in a well while playing in her yard. It took multiple days to rescue her and the whole story was documented on 20/20 or something like that. For some reason we had this story on VHS tape, and for some even odder reason, this was one of our favorite things to watch. That being said, we would play Jessica McClure with our Cabbage Patch dolls and try to rescue them out of holes and such. You know, just normal old child’s play. I try not to remember these odd stories of myself growing up, and I most assuredly do not like to share these treasures with too many people. However, yesterday, my mind was on wells, and it is quick leap for me from wells to good old Jessica McClure. As I was praying and journaling about where the Lord has had me the past few weeks, He brought to mind a field full of deep wells. Odd, I know, being as we are not a culture accustomed to wells. However, the writers of the Bible were incredibly accustomed to wells, as they were a natural and necessary part of their lives. According to historians and Biblical commentators, old and abandoned wells were often used as prisons or dungeons. You see, most of us, I would hazard to say all of us, have wells we are prone to become trapped in. Sometimes we fall in, sometimes we jump in, sometimes we are pushed into these wells. They vary from person to person and can look like depression, anxiety, alcoholism, perfectionism, fear, and a number of many other things. But the thing that all wells have in common is that they are incredibly deep and that the only way out of a well is to be drawn up and out. Not the happiest image, I know. But here comes the hope and the beautiful part. There is a well fisher. The word drew there is a Hebrew word meaning to pull up, to draw out, as one would gather water out of a well. Why does He do this? Is it because we have shown progress or because we are truly sorry? Is it because our well is better than someone else’s far deeper well? No. The Scripture is clear. God rescues us because He delights in us. I love this image of God as the well fisher, ready and waiting to draw us up and gather us out of our unique wells. I love that even though we spend our lives hopping from well to well, God continues to patiently draw us out of them in His time and His way. I love that He continually sets us back into broad places because He delights in us. This is all my hope as I hop from well to well.